What does any mature and sophisticated newly 29-year-old adult want to do on her birthday? I’m pretty sure the right answer is hide under a comfy blanket with coffee in hand and spend the day with her cat. That’s what I want to do, at least. The only problem is Pix will barely put up with the audacity of me ‘being present’ for so long before she realizes that laying in the sun is a much more tempting offer. I don’t blame her, really. Today is my birthday. The best thing about birthdays? Gifts. (And getting to do whatever the hell you want all day without anyone telling you you’re a lazy sack. Oh, and cake. Mmm) So, I thought it would be fun to give a present away. 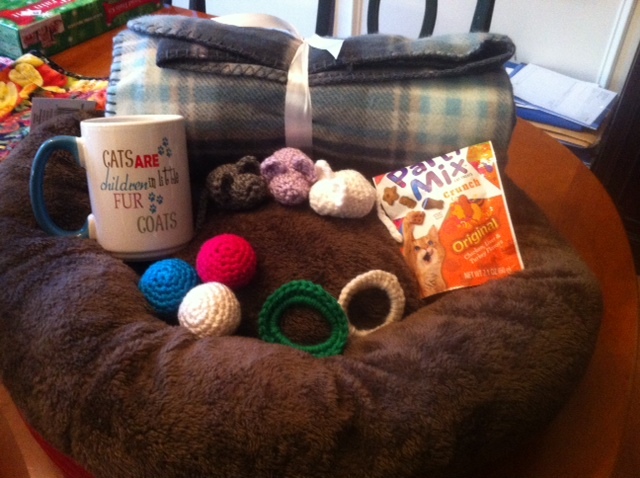 It contains the necessary items to attain my ideal ‘perfect day.’ A super soft blanket, a mug for your coffee, and fun things to make your cat(s) want to spend the day with you. All crocheted toys are done by yours truly. Normally, I sell them to raise money for the SPCA and these are the colors I had on hand. If you want specific colors, just ask! I hoard yarn in every color imaginable. To enter: Fill out the form below. In the ‘comment’ section of the form, please say what state you live in (US) or what country. You can enter from now through the end of Saturday (11:59pm EST). The winner will be drawn at random and announced here Sunday. If you don’t have a cat, or know any cat lovers: enter and donate it to your local humane society. I’m sure they would appreciate it. Next time, I’ll do a more generic giveaway. Like money, or an Amazon gift card. But, it’s my birthday. As Cartman would say: I do what I want! Firstly, Happy Birthday!!! 🎉 Secondly, the title to this post is brilliant lol. Enjoy your day! Happy Birthday! How nice of you to turn the tables and give something away! I don’t have cats, so I won’t enter. But I do want to say that this is a wonderful way to celebrate your birthday, and it’s a very generous gift. You and your husband are both awesome. Thank you 🙂 next time, I’ll make it so everyone can enter! WIshing you a blessed birthday today, Blair, and a long and happy life. State of Confusion, Nation of Craft-people! Does anyone recognize this locality? You’re so old! Holy Cow! Here’s a present. Wheres the ice cream? We are hungry, feed us now! And I sing it from the bottom of my heart. Happy Birthday! This is by far the cutest giveaway I’ve ever seen. And so generous. Happy Birthday! What a cool thing to do. He is very territorial for sure. Don’t mess with my gaff…! If it’s your birthday, why do we get the gifts? Happy birthday! Happy Birthday! I would enter your contest but don’t want to make you pay for overseas shipping – and besides, my cat spits and sputters and drools and squawks, but he doesn’t purr. Thanx anyway, but our kitty already gets more than I do :O( HAPPY B-DAY! (Sprinkles…) Gonna have some Champaigne, become a nuiscence, and wake up with a hangover, in jail? Most purrtant of all, weez wishin’ you a Happy and blest birffday. What an awesome and generous giveaway! But I hope YOUR day has been super blessed by the birthday fairy!! (I love it when she visits, hehe) Happy birthday!! I tried to enter, but it wouldn’t go. Maybe because I’m using Google Chrome? What fun! I love your idea. Happy Birthday!! Thanksgiving weekend, we found 5 little ones (about 4-5 weeks old). The first one on Thanksgiving morning had fallen into a bucket where I’d been collecting rainwater & was frantically trying to stay afloat. Her name is now Lucky. The next day we got her 2 brothers. Shadow (he’s black) and Nipper (from the chomp marks left on by better half’s hand). The guy across the street said a feral had them under his house. They were just old enough to start venturing out. On Sunday, following three days of rain, I heard frantic cries in our backyard. Two kittens were stumbling through puddles, in the dark, lost and calling out for mama. They came from under our house, from another feral. They’re about a week younger than the other 3. They’re now Marbles (marbled gray tabby) and Puddles. Which brings our number up to …. ahem… not gonna say. 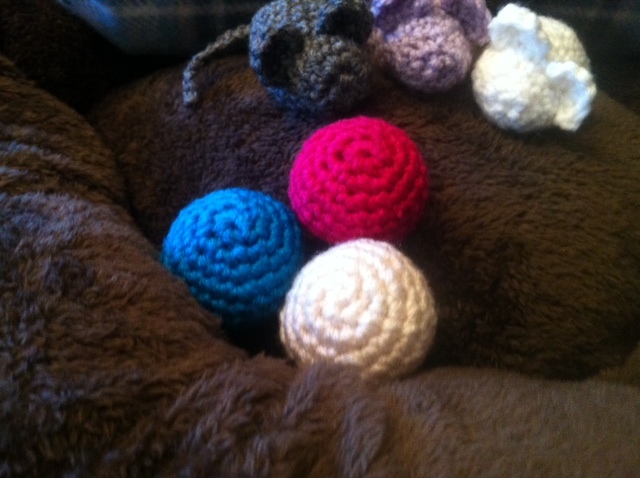 So seeing how you crochet cat toys for the SPCA – you just went up another notch in my book! Happy Birthday! I love the title! Happy Bday! My 13 year old cat died from cancer about a month before my 40th. Her death combined with the ridiculous number, was an opportunity to make my friends bring cat shelter donations (and alcohol) instead of gifts I didn’t need. Wow, thank you 🙂 That was so kind to say. Happy Birthday! This is my ideal birthday too…but it would also include my 2 dogs (my cat and dogs are best buddies lol). Belated happy birthday. Our cats only seem to like playing with things that don’t belong to them – used underwear, olives, bread. I live in South Carolina. What a really nice prize. My cats would love that comfy bed. 🙂 Thank you for the chance. Happy Holidays! Happy Birthday day! I only like young cats. The older cat are stringy and tough; taking much longer too cool . Happy birthday, and good luck with the giveaway. We’ve got no authorized cats around us, just a rather large rabbit who doesn’t see what the fuss about cats is. Gasp!!! I wuv kittie-ths! Thems so furs-thie!! I wub to pet thems, hold thems, and kiss thems between their cute little ears!! That’s so exciting! I can’t wait to be introduced to her. Don’t forget to add in her pictures, pictures, and more pictures!